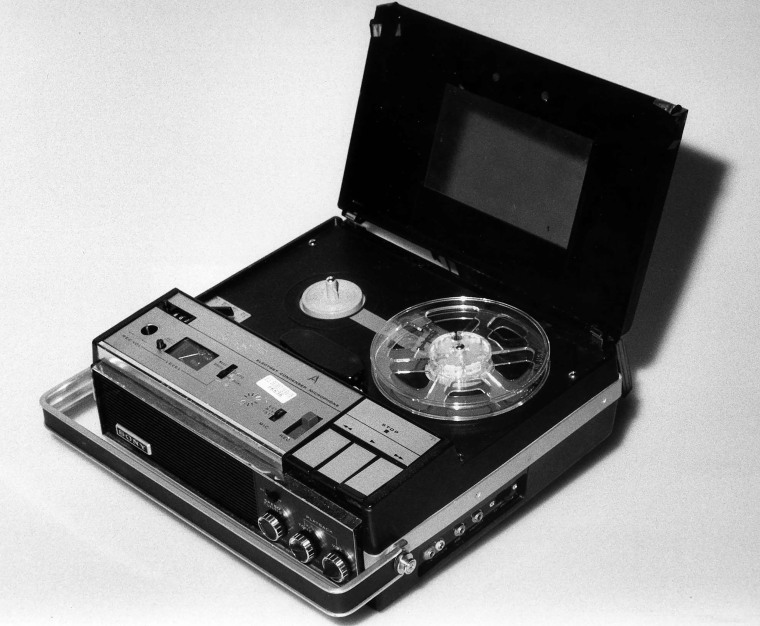 President Richard Nixon’s original White House tape recorder. 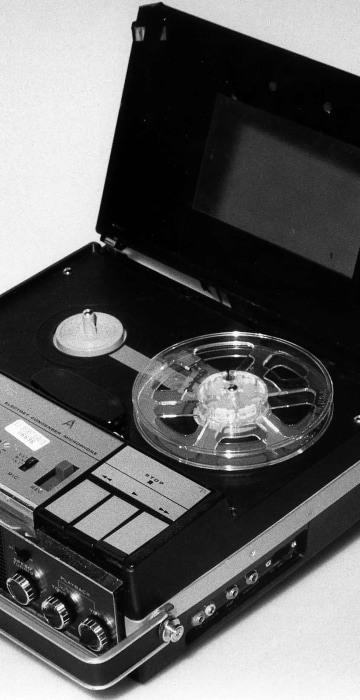 In addition to conversations about Watergate which would eventually lead to his resignation, Nixon’s White House taping system also picked up hours of conversations about the investigation of Vice President Spiro T. Agnew. U.S. Attorney George Beall of Maryland, featured on the cover of Baltimore Magazine in February 1974. Vice President Spiro Agnew waged an aggressive effort to pressure George Beall, who had launched a criminal investigation of bribery and corruption that began turning up evidence implicating VP Agnew. Vice President Spiro Agnew's attempts to interfere with the investigation into him centered around the Beall family. 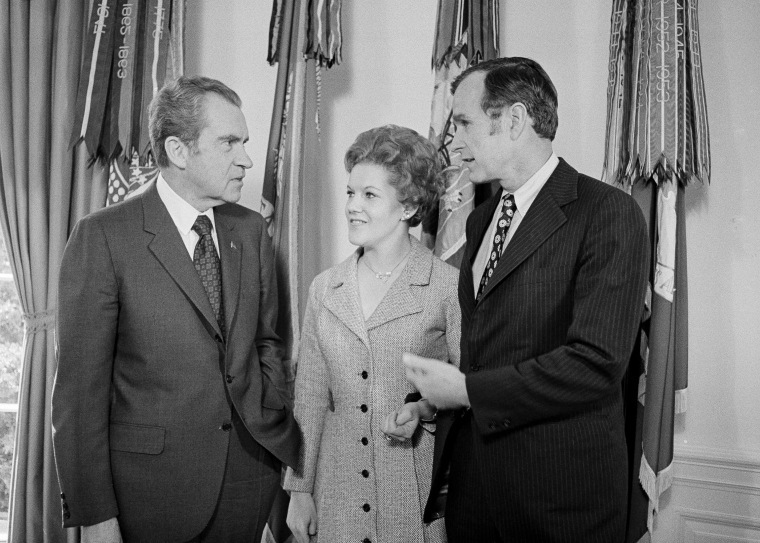 VP Agnew and the Nixon White House attempted to pressure the U.S. Attorney investigating Agnew, George Beall (pictured, lower right), through his brother, Republican Senator Glenn Beall Jr. (pictured, lower left). The father of the Beall brothers--Glenn Beall Sr. (pictured, top)-- previously held that same U.S. Senate seat in Maryland. President Richard Nixon campaigning in Maryland in 1970 for Rep. Glenn Beall Jr. (pictured, far left). Nixon and Vice President Spiro Agnew later leaned on Sen. Glenn Beall to help them influence the investigation of Agnew that his brother, U.S. Attorney George Beall, was running. They felt Sen. Beall owed them a favor after they helped him "bury" that 1970 Senate race. Vice President Spiro T. Agnew swearing in Republican Senator. J Glenn Beall Jr. of Maryland in January 1971. VP Agnew would begin pressuring Sen. Beall in 1973 to help him influence the criminal investigation that Sen. Beall's U.S. Attorney brother was running. 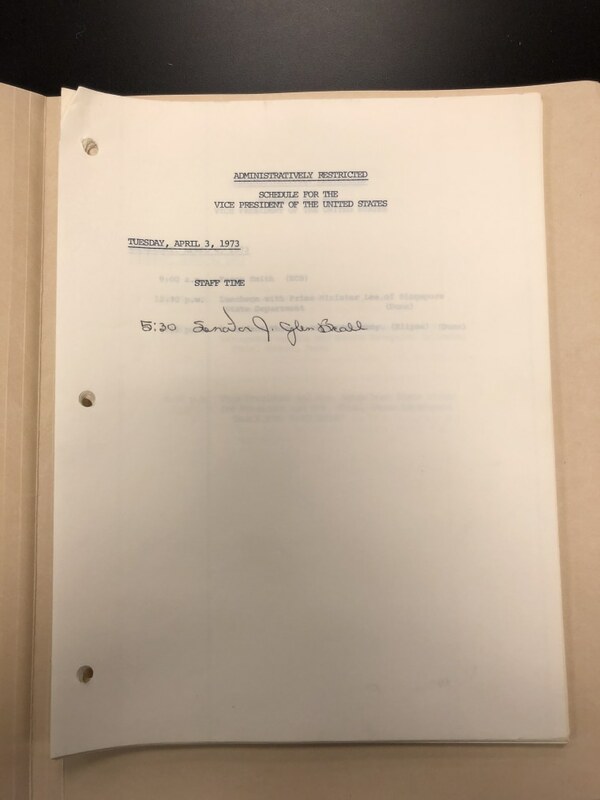 Vice President Spiro T. Agnew's official schedule for April 3, 1973, which shows only one meeting, with Senator J. Glenn Beall of Maryland. Days later, VP Agnew would enlist the help of Nixon White House Chief of Staff HR Haldeman in an elaborate effort to obstruct the investigation that Sen. Beall's brother was running. Agnew would tell President Nixon in the Oval Office, "Glenn Beall's the only way to influence this." President Richard Nixon meeting with RNC Chairman George HW Bush in the Oval Office in March 1973. Nixon and his Chief of Staff Al Haig used George Bush in the Summer of 1973 to help them influence a criminal investigation of Vice President Spiro T. Agnew. Official memo to file written by U.S. Attorney George Beall of Maryland in July 1973. In the memo, he describes various "expression[s] of concern" about his investigation of Vice President Agnew that were passed along to him through his brother, Republican U.S. Senator Glenn Beall. George Beall notes in the memo (page 5) that individuals who approached his brother about the investigation included Vice President Agnew himself and the Republican Party Chairman at the time George HW Bush.